If you’re interested in purchasing a Weber grill, congratulations! You’re already one step ahead on the road to selecting one of the highest-quality, most dependable and all-around amazing gas grill available on the market. But not all Weber grills are created equal, and the extensive line of Weber gas grills is designed to serve a wide range of budgets, users, and a diverse spectrum of grilling tasks. So, we’ve put together this helpful bbq buying guide to, well, guide you along your way to finding and choosing the perfect grill for your exact needs and preferences. Without further ado, let’s get started! PRO TIP - Make sure to contact our staff at (888) 714-4938 to inquire about unpublished savings on Weber Grills. Not all grills are created equal. In this section we’re going to highlight three Weber grills that we’ve classified as some of the Best of the Best. We’re talking the most versatile, most portable or all-around most awesome grills available in the current Weber offering of high-quality grilling solutions. The Genesis II E-310 is what we call the Weber workhorse. This is a perfect all-around product designed to meet all of the needs of the average family who loves to grill. It boasts a reasonable and budget-friendly price point, yet still comes packed with all the most popular and powerful features of Weber’s best offerings. Three individual burners, digital thermometer-compatible, with a 669 square inch cooking area including a Tuck-Away warming rack. Add in wing tables on either side, Flavorizer bars underneath the grate and Weber’s legendary Infinity ignition and you’ve got the perfect grill for just about anyone. Looking for a more portable grill that will still satisfy the demanding grill master in you? Consider the Weber Spirit E-210, a two-burner beast with an impressive 450 square inch cooking space despite its svelte construction. 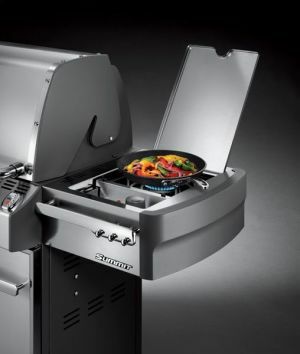 It’s got all the best Weber features, including Flavorizer bars and an Electronic Crossover ignition system. If you’re a balcony or small deck griller, this might be the grill for you. However, beware that assembly of this grill is a beast. If you’re looking for the best of the best, the uncontested champion of all things grilling, then brace yourself and meet the Summit S-670 with an awe-inspiring six powerful burners and simply massive 838 square inches of total cooking area, all in a space-age stainless steel body. While it won’t literally rocket you into the stratosphere, the grilling capabilities packed into this gorgeous machine will certainly make you feel like you’ve broken free from gravity. 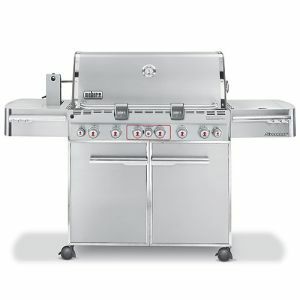 Stainless steel flavorizer bars, stainless steel cooking grates, a bonus side burner, a patented Snap-Jet burner ignition system and built-in lighting round out the flagship Weber model. We’re not worthy. To truly understand how Weber gas grills came to be regarded as the gold standard in backyard grilling, it’s important to take a quick look into the rich history of Weber and how it came to be. Back in 1952, a man named George Stephen was working at a family metalworking business with a specialty in building metal buoys for use in bodies of water. While he was looking at the design profile of one of these buoys, he was struck with a brilliant idea. What if grills had a dome-shaped top grill and lid that would serve the dual purpose of protecting the food being grilled and keeping the sweet barbecue grilled flavor inside? He built his prototype from a buoy he cut in half, and the world’s greatest grill was born. Since then, Weber has continued to grow, innovate and revolutionize grilling to the point that Weber grills are now available in over 70 countries. However, they’ve always stuck to their made-in-America roots with factories headquartered in the company’s home state of Illinois. From the company’s humble beginnings as a sparkle in the eye of a buoy manufacturer to a star in the gas grill market, Weber has remained committed to providing the quality, features and grilling experience its loyal customers have come to expect over decades of service. But to learn a bit more about what makes Weber grills great and to differentiate from one model to another, we’ll have to take a look at what exactly makes up a gas grill and the features that separate a fine grill from a truly great one. 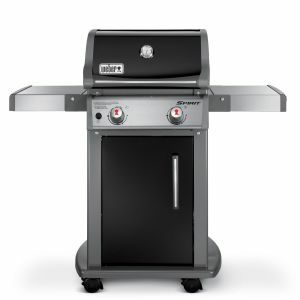 The highest-quality gas grills feature a lid that perfectly balances all of the features and tasks for which it must be responsible in ensuring a safe, effective and delicious grilling experience. First of all, there must be proper ventilation for safe and quality cooking. The best grills also offer a highly visible thermometer on the lid to ensure proper cooking temperature easily and seamlessly during preparation and cooking. Because cooking can get messy and grills are often exposed to the elements, a stainless steel control panel can be an excellent feature to ensure that the grill controls hold up over time and under pressure. Beyond the lid, you’ll want a grill with plenty of exterior surface space for keeping your tools, ingredients and cooking materials handy while grilling. Great grills have wing tables on either side with plenty of surface are for everything you might need, and Weber grill tables can be folded down when out of use for storage and space. 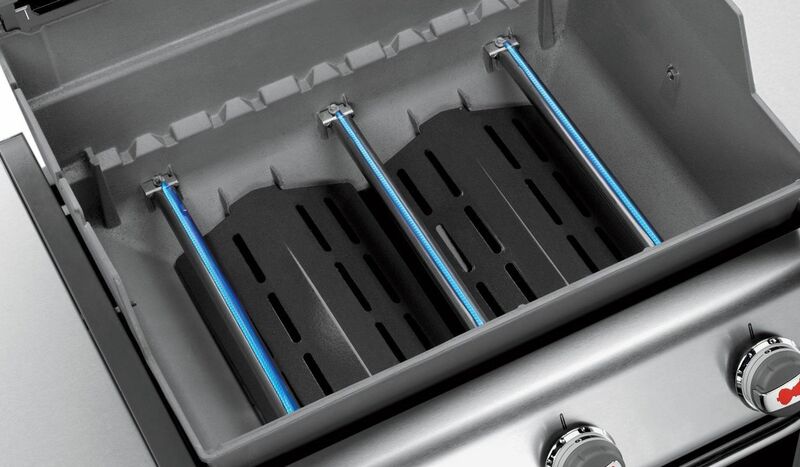 Nearly all Weber grills also feature either an open or closed storage area underneath the grill for additional materials. The cooking grate in your grill has a big impact on the quality of your grilling experience and the ultimate quality of the food you cook. The best cooking grates are made from cast-iron and feature a porcelain enamel which enhances flavor, reduces sticking and tearing of food and provides an even heat profile across the food’s surface. Cast iron has become the go-to high quality material for cooking grates because of the way it holds in flavor and increases in seasoning over time. Just think about how much better your cast iron kitchen cookware flavors food as opposed to your lower quality cookware. The burners are the element of the grill that do the actual cooking of your food. The gas ignites and powers the flames, allowing you to get that wonderful barbecue taste that’s the envy of non-grillers everywhere. In any quality grill, knobs on the grill exterior should allow you to independently adjust the flame strength and size of the burner flames, and those burners should run the length of the inner cookbox to ensure even heat and cooking. While we’ve covered the main components of any grill, it’s truly the extras that set apart a good grill from a great one. For example, porcelain-enameled trays that keep grease from falling back into the flame and igniting while also increasing flavor of food (Weber’s patented methods are called Flavorizers). There are also interior warming racks where you can keep food further from flames so that they stay warm without being overcooked, plus important features like grease catching trays and pans for safety and cleanliness of your grill. 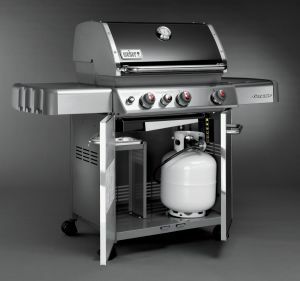 At Weber, gas grill manufacturing has eventually become streamlined into three primary series, each with a set of unique models built to suit personal grilling needs. We’ll do some more comparing of the different lines throughout this guide, but for now let’s make a quick introduction. Weber’s smallest range of gas grills packs just as much punch as its cousins in a more streamlined package. These 2- or 3-burner grills are the perfect size for casual grilling for couples, families or individuals and are made to fit in small yards, patios or balconies. They’re still chock full of features including fold-down side tables, Flavorizer bars and stainless steel finish where it matters most, including the burners. The Genesis II series features a wide range of grill sizes and features, ranging from 3 burners in the E-310 model all the way up to S-435 4 burners. Genesis gas grills come in open cart or eclosed cart designs. The E models feature porcelain enamaled grates while the S models feature stainless steel design for better heat retenton. The exclusive SE models have a handle light as well as 9 mm thick cooking grates. All Weber Genesis II models feature the new and powerful GS4 design. Ranging from 4 to 6 burners, the Summit series is visually gorgeous and packs a lot of power under the hood. The 470 series even features a patented Sear Station burner that packs on the heat to get that seared-in flavor that grillers dream about. The S-460 and S-660 models are designed to be built-in to backyard configurations, so the Summit series covers a wide range of uses, applications and aesthetics for every type of grillmaster. When it comes to the size of their grill, many cooks and backyard chefs think that bigger is always better. But when selecting your grill you should keep in mind the factors that matter most, because going big is a tradeoff in other areas that you might not initially consider. There are too significant disadvantages to choosing a larger grill. First of all, large grills take a longer time to heat up. It’s simple science—a larger space requires more heat and energy before it reaches a certain temperature. Just imagine trying to heat a gymnasium with a space heater as opposed to a small bedroom. This means longer wait times when cooking, which can be deadly if you’ve got a family of hungry mouths ready for some grilled deliciousness. The other disadvantage of larger grills is that the use more gas. While gas grills have become more efficient, it’s a fact that those with larger burners and more burners to fuel will use up gas much quicker than smaller models. Keep all of this in mind when selecting your gas grill. How much grill space do you really need? Do you entertain larger groups often, or are you generally cooking for you and your small family? Are you big eaters or do you like to enjoy smaller portions? All this will help determine whether you should opt for a smaller grill or go big. It’s a personal choice, and there are inherent benefits and drawbacks on both ends of the size spectrum. Your grill grate is the very surface where you’ll lay down your precious meats and other grill ingredients, so the way it’s made and the materials it uses matter a great deal. 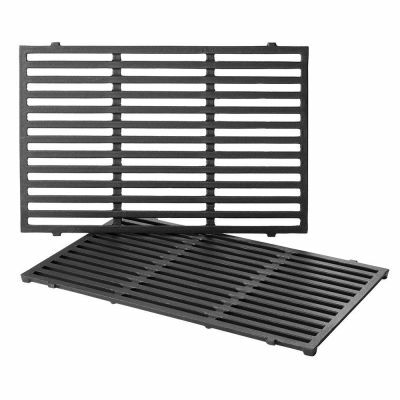 Generally, there are tree kinds of grates in use in quality grills— stainless steel, pure cast iron and porcelain-enameled cast iron. What’s the difference? Let’s find out. 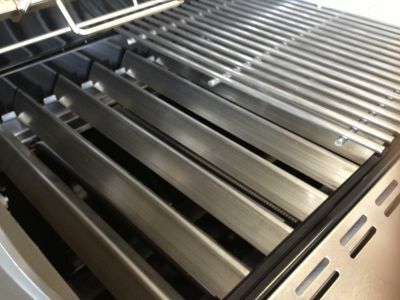 A stainless steel grate is a fine choice for all the reasons that have made stainless steel popular—it’s resistant to rust and damage, impressively durable, and serves as a great cooking surface. On the negative side, stainless steel doesn’t season as well as cast iron over time. Some ingredients will stick to the surface, leaving a mess of both the cooking surface and whatever you happen to be cooking. For this reason, many individuals opt for cast iron or porcelain enamel instead. Porcelain enamel has risen to popularity because it simply will not rust, ever. With repeated grilling and considering that food is being placed directly onto its surface, this is an extremely important feature for many grillmasters. Porcelain enamel also holds up against acidic foods which would otherwise wear away the seasoning on bare cast iron grates. Whether to use stainless steel or porcelain enameled grates is a personal choice, but generally porcelain enamel is the finer choice for grilling because of its durable properties and unfailing safety when it comes to cooking food. A side burner is an extra burner that’s usually located on one of the side tables outside the main grilling area. These can be used for a variety of purposes, but many grillers use them to warm or cook sauces, or to cook additional sides that will accompany the main event. If you often find yourself multitasking while you’re grilling, a side burner might be a great idea. A sear burner is a specially designed burner that uses a series of small, intense flames to heat up a cooking surface (generally with grid marks) to extreme heat. Its primary purpose is to sear and brown the outside of steaks just before they go on the grill, as this has been proven to lock in flavor and increase the savory, juicy elements of a steak. The searing burning can be used for other uses as well, and it’s a powerful tool in high-quality grills. The smoky flavor that comes from burning woodchips and cooking food over the emitted smoke is one that’s coveted by grillers everywhere. 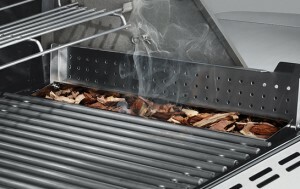 Some Weber gas grills offer a unique smoking feature that allows you to use the heat from your grill to heat up a special compartment near the grill’s rear which can be filled with smoking woodchips to add that delicious smoky flavor. 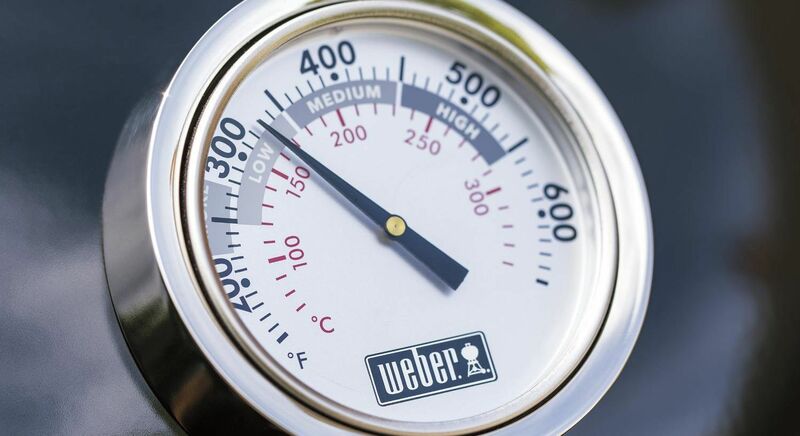 Understanding and using your Weber grill’s temperature gauge is critical to effective grilling. Different meats and foods cook best at different temperatures, so you’ll want to give your grill the chance to heat to the proper temp before you jump into grilling. Weber temperature gauges are designed to be ultra-accurate, giving you real-time information about the internal temperature of your grill. That way you’ll know exactly when it’s time to throw on the meat or whatever you happen to be cooking up that day. And of course, our temperature gauges are built to last with highly durable lenses and stainless steel construction. First-time grill buyers might be surprised to discover that when it comes to gas grills, there is more than one type of gas you can use. The two primary options available are propane (also known as liquid propane - LP) and natural gas, and they each come with their unique advantages and setbacks. Before we delve into those distinctions, it’s important to note that each individual Weber grill is set up to run on either propane or natural gas, and cannot be retrofitted after the fact to comply with a new fuel source. Keep this in mind when buying. Now let’s talk about propane and natural gas. 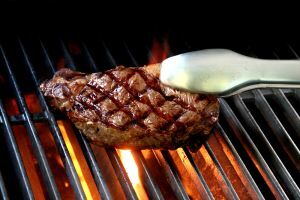 Propane has remained a popular choice for grillers everywhere for several reasons. First of all, it’s got a bit more energy in the tank than natural gas. Propane holds 2,500 BTUs per cubic foot while natural gas offers only 1,000. Opting for propane means that you’ll always have all the heat you could ever wish for when hitting the grill. Additionally, propane is always readily available at most local stores. If you run out, you’re a quick trip away from a brand new tank which you can quickly and easily hook up to your grill’s fuel line. Propane also requires no up-front costs or time to install. Just buy a tank, hook it up to your grill and you’re ready to go. As for natural gas, the main advantage is that if you’ve got a natural gas main available on your property, you’ll be ready to go with all the fuel you could ever need and no fear of ever running out. Unfortunately, not all properties have natural gas mains readily available for use at the grill, and installing one can bring some fairly hefty up-front costs. That being said, natural gas has a smaller environmental footprint than propane and, once it’s been setup, it means saying goodbye to having to swap out propane tanks when you run out. If you’re a consistent griller, this reduced cost and hassle can be a big plus in the natural gas column. The decision of whether to go with natural gas or propane will depend largely on your grilling habits, current gas availability, and personal taste. Take the time to consider the advantages and disadvantages of each fuel source before you buy and you’ll be good to go. All Weber grills use stainless steel heavily in their design and manufacturing. The reasoning for this is simple—grills take a beating, and stainless steel is proven to stand up to rust, wear, damage, and corrosion. In a single grilling session, the parts of your grill can be exposed to intense heat, moisture, grease, oil, metal scraping, exposure to open flame, smoke, and discarded food items. That’s a whole lot of potential damage. That’s why Weber chooses to use the highest quality stainless steel parts so that your grill can take a hit and keep on working flawlessly for years to come. Most of Weber’s grills include an impressive feature that they call Flavorizer bars, which serve a dual function that’s critical for your safety, grilling experience and overall flavor of your food. These bars lay underneath the cooking grate, between the grate and the burners, and catch excess oil or grease that drips from the food you cook. Not only does this keep the oil or grease from falling into the flames and igniting, which could be a hazard, but the oil evaporates back up into your cooking ingredients, injecting them with even more flavor that multiplies the longer you cook. The Flavorizer bars are one of our favorite features of Weber grills, and they’re part of what sets apart Weber grills from other products and manufacturers. While Weber seems to be a fan of the sleek, stainless steel silver and black look, they do offer color options for our more vibrant-minded grilling fans. The Q 1200 portable grill, for example, comes in seven different, vivid colors to suit your unique personality. The best thing about Weber grills is just how many varieties they offer, so you’re guaranteed to find a grill that perfectly fits both your grilling style and needs and your aesthetic preferences all in one awesome package. Keeping your gas grill clean and maintained is not only important for ensuring it has a long life, it’s important for keeping you safe and ensuring that you have a long life, too. Here are some of the most important regular maintenance tasks you should be doing on a regular basis to keep your Weber grill in tip-top shape. Weber grills are designed to remain free from leaks, but the elements happen and leaks may occur. One way to check for links in your hose or tank is to use a soapy water solution in and around the connect points of your tank and tubes. Then turn on your tank, and if you find bubbles forming it’s a pretty sure sign that you’ve got a leak. This means you should not use the grill under any circumstances until the leak has been corrected. 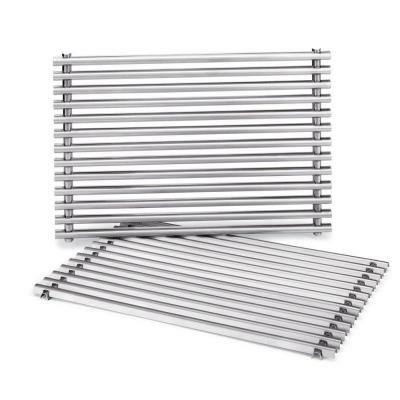 Use a grill cleaning brush (Weber manufactures a high-quality one made specifically for stainless steel) to remove food pieces, oxidation and other debris from the surface of your burners. This not only keeps them looking clean but also keeps burners from becoming blocked, which can lead to fires. Grease will naturally collect on parts of your grill, but too much grease can be damaging and unsafe. Use a scraper to scrape off any grease that’s been solidified on the grill down into the grease tray. From here you can empty the solidified pieces from the grease tray down into the catch pan. The catch pan can then be emptied, and you’re ready to go once you replace a new aluminum liner. Easy greasy. Alongside your Weber grill itself, you also have some options available when it comes to additional accessories for improving your overall grilling experience and the extending the life and quality of your grill. 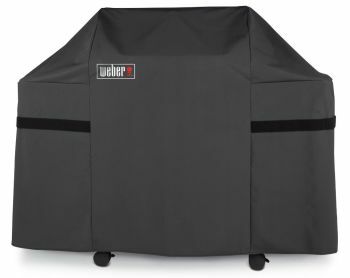 Weber grill covers are designed to keep your grill protected from the elements to ensure that it remains in brand-new shape for years to come. They use water-resistant fabrics that are also designed to resist wear from the sun, guaranteeing that you’ll protect your most delicious investment. Weber highly recommends purchasing a grill cover that’s matched to your grill. It’s a small cost that can quite literally add years to the life of your new grill. A cleaning brush is a critical accessory to your Weber grill, as it can be used to scrub excess dried grease, food particles and other contaminants from the surface of your grate, burners, Flavorizer bars and surrounding areas. There are a wide range of brush types available, but the longer and more durable the better. Keep your’s next to or inside your grill’s storage space and give your grill a quick scrub-down after each grilling session. What would a grill be without some world-class grilling tools to help you get the job done? Weber offers a range of special tools made especially for grilling. These include basics like spatulas, tongs and spikes and other peripherals like aprons, charcoal scrapers, chimney starters, wood chips for smoking, and dozens of other goodies that will enhance your grilling experience and expand your arsenal of grilling methods. For a full catalog of available accessories, visit the Weber website and click on the Accessories tab. With high-quality Weber accessories, the world is your grill. We’ve already touched on Weber’s methods of ensuring safety when it comes to burners and fuel sources, but what about other elements of safety? A safe burner doesn’t help you much if your entire grill falls over on your foot. Fortunately, Weber has ensured that this will never happen. Weber grills are built with perfectly balanced bodies and a low center of gravity, making tip-overs nearly impossible. Meanwhile, all wheels lock in place to avoid unwanted rolling while in use. Plus, each of our grills is devoid of sharp corners so you don’t have to worry about you or your kids being cut or scraped on any extruding edges. Nothing derails a fun grilling session like an injury on the field, so Weber has taken every step to guarantee that this doesn’t take place. Weber has long been renowned throughout the world for it’s simply unmatched warranty program, the best available anywhere for its price. 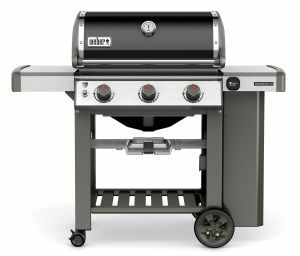 Unique warranties reply to each specific product, but for an example let’s take a look at the Weber Genesis II Series warranty. Nearly all parts including the cookbox, lid assembly, stainless steel burners, stainless steel cooking grates, Flavorizer bars, ignition system, and grease management system are subject to an incredible 10-year warranty against rust, burn through or ignition start issues. For the cookbox and lid, this is in addition to a 2 year warranty for damage to the paint excluding fading and discoloration. For porcelain enameled cast iron cooking grates and Flavorizer bars, Weber offers a 5 year warranty against damage, and all remaining parts are subject to a 2 year warranty. 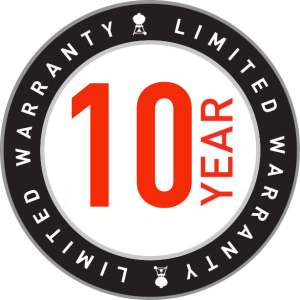 Weber is able to offer such robust warranties because they have such a profound trust in the products they create and their quality. We know that our products are built to hold up to strenuous use, and if any issues ever do arise, we want our customers to feel confident and secure in knowing that they’ll be taken care of. That’s the power of the Weber warranty, the best in its class. Weber grill makers are confident that once you receive your grill you’ll have everything you need to get cooking. But Weber knows that over the course of your grilling, problems or questions may arise that require some outside expertise. That’s why the Weber customer support line is open fourteen hours a day, seven days a week, every day of the year except Christmas Eve through the day after Christmas. That means there’s never a bad time for grilling, which means that you can always count on Weber to be there to answer all your questions. But what about if you lose a part? There’s nothing more frustrating than having to wait for a reordered part that takes days or even weeks to arrive. That’s why Weber will overnight any part you order so that you can have it with you, ready to grill, the very next day. Weber wants you to get out and grill, not sit and wait by the door for days wishing you could throw some steaks on your barbecue. 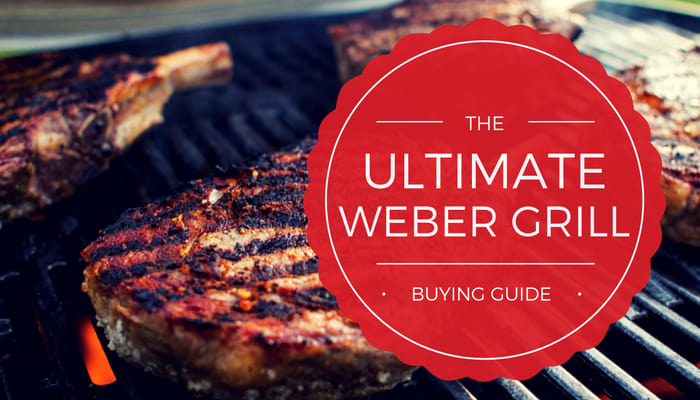 We hope this Weber buying guide has been a comprehensive, helpful overview of what you can expect when shopping for and using a Weber grill. What we haven’t mentioned yet is that Weber offers the best prices on high-quality grills when compared to any other grill manufacturer in the country. And with nationwide shipping, that award-winning quality can be set up in your backyard in a matter of days—no matter where you live. If you find that you still have questions, our help line is always open and our website is always online. Our blog is filled with grilling tips from certified experts, and our entire line of products is available for comparing and, let’s be honest, drooling over. Get a Weber, and get to grilling.